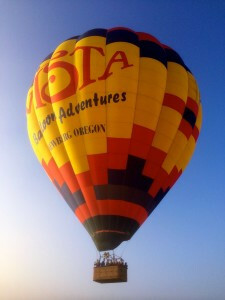 For larger groups, we have six balloons with which we can fly up to 50 guests. Flights always include our sparkling hot brunch and celebration after the flight. Ballooning can be a great team building activity, as there is an inflation and deflation process your team can participate in. Ballooning can be a very unique team building opportunity or memorable reward for a job well done. Please contact us so we can help create a custom event people will remember! Upon landing, our ground crew will meet you to pick you up and deflate your balloon. You are very welcome to participate, however, it’s completely fine if you choose to stand by and admire the process. After the balloons are deflated and put away, board our vans for a 15-minute ride back to the launch site where you will be served a sparkling brunch. Plan on approximately 3 hours for the whole experience. Book Now!